[162 Pages Report] The overall Internet of Things market size is expected to grow from USD 170.57 billion in 2017 to USD 561.04 billion by 2022, at a Compound Annual Growth Rate (CAGR) of 26.9% during the forecast period. The Internet of Things is in its growing stage. This can be attributed to the fact that there has been a development of wireless networking technologies, increase in cloud platform adoption, advent of advanced data analytics and data processing, reduction in cost of connected device . The concept of IoT has revolutionized the way organizations across industry verticals interact with their customers. IoT helps organizations in increasing operational efficiency and optimizing business outcomes. The base year considered for the study is 2016, and the forecast has been provided for the period between 2017 and 2022. A growing number of wireless technologies now enable communication among devices. This increase in connectivity will lead to a larger base of individuals interested in purchasing IoT devices. High-speed network connectivity has created many new options in organizations across industry verticals. The advancement in high-speed wireless network technology and the number of devices enabled with this technology are increasing rapidly. LTE is the modern high-speed wireless communications standard for mobile phones and data terminals, which support 4G services. It is easily deployed and optimizes network connectivity by using separate radio links for the device-to-tower uplink and tower-to-device downlink. LTE is important because it enables more efficient use of the ever-limited spectrum available to connect low-power IoT devices with back-end systems. Additionally, the introduction and evolution of IPv6 is driving the demand for connected technologies in organizations. The deployment of the IPv6 addresses will have a positive impact on IoT connected devices. Moreover, an additional feature that IPv6 has is that the IPv6 makes the management of networks easier due to auto-pattern capabilities and provides advanced security and privacy measures. During this research study, major players operating in the Internet of Things market in various regions have been identified, and their offerings, regional presence, and distribution channels have been analyzed through in-depth discussions. Top-down and bottom-up approaches have been used to determine the overall market size. Sizes of the other individual markets have been estimated using the percentage splits obtained through secondary sources such as Hoovers, Bloomberg BusinessWeek, and Factiva, along with primary respondents. The entire procedure includes the study of the annual and financial reports of the top market players and extensive interviews with industry experts such as CEOs, VPs, directors, and marketing executives for key insights (both qualitative and quantitative) pertaining to the market. The figure below shows the breakdown of the primaries on the basis of the company type, designation, and region considered during the research study. The Internet of Things market includes various vendors providing Internet of Things solutions and services to commercial clients across the globe. Companies such as as Intel Corporation (US), SAP SE (Germany), Cisco Systems, Inc. (US), Microsoft Corporation (US), Oracle Corporation (US), International Business Machine (IBM) Corporation (US), PTC Inc. (US), Google Inc. (US), Hewlett Packard Enterprise (US), Amazon Web Services Inc. (US), Bosch Software Innovation GmbH (Germany), and General Electric (US) have adopted partnerships, agreements, and collaborations as the key strategies to enhance their market reach. In May 2017, SAP launched SAP Leonardo as its IoT software. This software aims to provide businesses new enterprise models to transform digitally. These digital businesses would work seamlessly with IoT, big data, and machine learning, using design-thinking services. In April 2017, Microsoft announced the launch of Azure IoT suite for connected factory preconfigured availability. This Azure suite is a 6-step framework solution, designed to help businesses operate at their maximum efficiency. Azure IoT suite for Industries 4.0 has cloud-enabled equipment for industry, which could be seamlessly integrated with the existing machine. The suite offers the ability to manage equipment remotely and without disturbing operations. What are new application areas which the Internet of Things companies are exploring? The Internet of Things (IoT) market is expected to grow from USD 170.57 million in 2017 to USD 561.04 million by 2022, at a Compound Annual Growth Rate (CAGR) of 26.9%, owing to the advent of advanced analytics and data processing techniques, which have been useful to derive results from high volumes of data collected from the machine-to-machine communication devices. The IoT market consists of things or objects that are connected to the internet, i.e. anything can be accessed anytime and from anywhere. It comprises integrating sensors and devices into everyday objects that are connected to the internet over fixed and wireless networks. The fact that the internet is present everywhere makes mass adoption of this technology more feasible. Given their size and cost, the sensors can be integrated easily into homes, workplaces, and public places. This process enables objects to connect and manifest themselves over the internet. In addition, in IoT, any object can be a data source. IoT is not a revolutionary or innovatory concept. It is an evolutionary perception, equivalent to the evolution on the networking technologies of the present (internet, service platforms, and wireless). 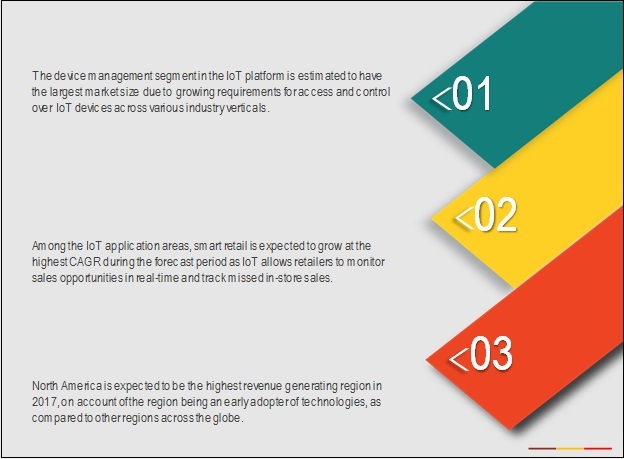 The IoT market is segmented on the basis of software solutions, services, platforms, application areas, and regions. The software solution holds the largest market size among all the other segments, owing to the increase in development of cloud-based applications and adoption of cloud for storage of data. The service segment is categorized into professional services and managed services. The application area segment is segmented into building and home automation, smart energy and utilities, smart manufacturing, connected logistics, connected health, smart retail, smart mobility and transport, and others (education and agriculture). North America is expected to hold the largest market share in the IoT market in 2017. The rapid digitalization across industry verticals and technological advancements have fueled the growth of the IoT market. With these developments, the IoT market in North America has gained a significant share. Manufacturing and automation companies in the region are incorporating IoT solutions to boost their efficiency. Most of the enterprises across the US have been populating the North American region to dominate the IoT market. Asia Pacific (APAC) consists of emerging economies. The IoT in energy and utilities means the deployment of IoT solution in power generation industry. The solutions are primarily aimed at achieving convergence of machines and intelligent data to enhance the operational efficiency targets being set by the energy companies. The development of ‘Smart Grids’ is the first application of IoT in the energy sector. They are capable to meet rising demand, increasing quality and reliability of power supplies, increasing efficiency and can integrate low carbon sources to the power network. Moreover, the energy sector has started deploying end-to-end solutions such as ‘Advance Metering Infrastructure’ (AMI), which enables two-way communication between the customers and utilities; and ‘In-Home Displays’ (IHD), which allows consumers to monitor and control their usage of electricity. Smart manufacturing is an integration of machine and human intelligence and data sharing between sensors, computerized control, information technology, and production management software. It interconnects and harmonizes individual stages of manufacturing production to advance plant-wide efficiency. It allows business to develop advanced models and simulation for optimization of manufacturing process. Manufacturing enterprises have been integrally focusing toward increasing their business process efficiency and production output with optimum resource utilization. One of the key factors driving the manufacturing enterprises toward IoT-enabled deployments is having standardized and consistent unified view of the data and processes for seamless access for most of the stakeholders. Industrial IoT vendors have been achieving control over multiple heterogeneous manufacturing processes by integrating advanced IoT platforms and solutions to automate manufacturing operations. The market for IoT home automation is advancing with the introduction of connected devices for buildings and houses. Nowadays, consumers are increasingly interested in knowing how home automation can provide more convenience, savings, and security. IoT home automation promises to open up significant new sources of revenue and allow businesses to connect with customers to deliver better service, more value, and greater innovation. However, managing a multitude of connected devices requires highly advanced IoT software. The companies are providing platforms that are managing IoT home automation devices and other connected solutions. It takes the complexity out of provisioning and securing IoT products, managing, and integrating the data they produce and turning that data into insight. IoT is reshaping and revolutionizing the retail industry. The IoT in retail is accelerating the time to solution deployment, simplifying the path to cost savings, new efficiencies, inventory accuracy, smarter marketing, and better customer experiences with an end-to-end solution. With the advent of additional technologies and improvements in sensors, better connectivity and communication solutions and new devices, lead to the development of the smart retail industry. What are the upcoming industry applications for IoT market? The lack of consistency among the standards for interconnectivity, interoperability, and security threats are some of the restraining factors for the growth of the IoT market. Moreover, the growing demand for bandwidth requirement is one of the major challenges impeding the market growth. 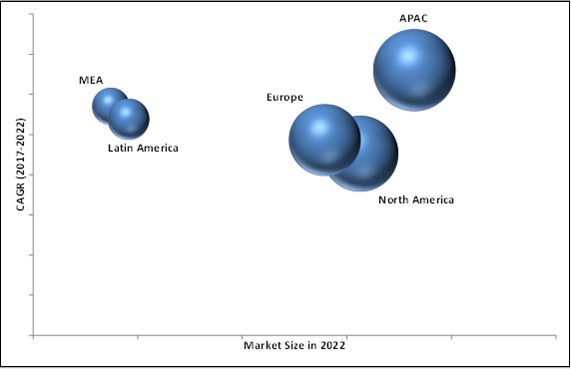 However, the recent developments, new product launches, and acquisitions of major market players in the IoT arena are boosting the growth of the market. Key players in the market include such as Google Inc. (US), Hewlett Packard Enterprise (US), Amazon Web Services (US), Bosch Software Innovation GMBH (Germany), General Electronics (US), Intel Corporation (US), SAP SE (Germany), Cisco Systems, Inc. (US), Microsoft Corporation (US), Oracle Corporation (US), International Business Machine (IBM) Corporation (US), and PTC Inc. (US),who have been at the forefront in offering innovative IoT platforms, services, and solutions to their commercial clients across diverse locations. 12.10 Amazon Web Services, Inc.